Why not add a festive twist to a traditional favorite? 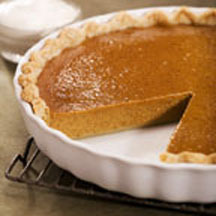 Made with better-for-you pumpkin, this tasty recipe features a hint of bourbon. For Filling: Mix sugar, cinnamon, salt, ginger and cloves in small bowl. Beat eggs in large bowl. Stir in pumpkin and sugar-spice mixture. Gradually stir in evaporated milk and bourbon. For Bourbon Whipped Cream: Whip cream in large mixer bowl until soft peaks form. Add brown sugar, bourbon and ground ginger; continue to whip until stiff peaks form. Nutritional Information Per Serving (1/8 of recipe): Calories: 270 Calories from Fat: 90 Total Fat: 9 g Saturated Fat: 4.5 g Cholesterol: 75 mg Sodium: 290 mg Carbohydrates: 40 g Dietary Fiber: 2 g Sugars: 27 g Protein: 7 g.